PWLL DU CHALLENGE. The half marathon of 2015. 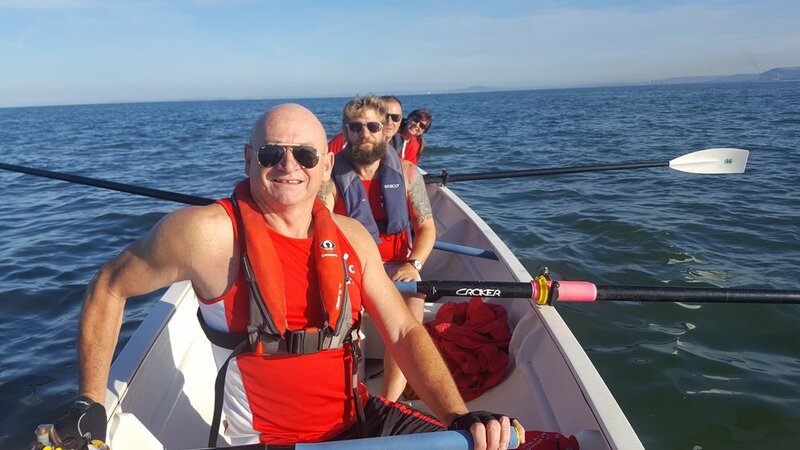 In late June, we hosted our own race ‘Mumbles Pwll Du Challenge’ an 17km row from Mumbles to Pwll Du and back. Many Welsh Sea Rowing clubs attended: Wisemans, Aberaeron, Barry, Towy and our newest club Gower Sea Rowers, along with friends and family supporters. Remember me saying rowers can be a bit mad?........Well Barry Rowing Club decided that they would row to Mumbles, a 64km journey, setting off at 5.30am! Members of the club wanted to raise funds for a nine-month-old girl called Mali who was born with three holes in her heart. They were also raising funds for the Coastguard Association. They arrived in Mumbles at 9.30am, just in time for breakfast and a very warm welcome. Fantastic, heart-warming achievement Barry Rowers! Mumbles teams were the fastest in the race with the Men’s Double Yole, Men’s Supervets and the Mixed Team ‘Double Dragon’ all winning 1st prize trophies in their categories. Everyone had a fabulous day racing with usual post-race celebrations of feasting and drinking with our Welsh Sea Rowing family. Huge thanks go to ‘The Pilot Inn and JD Sports for sponsoring us, we really appreciate it! The modern racing period at Mumbles Rowing Club has produced some unintentionally monster courses. In 2013 we nearly killed off the ladies crews with a finishing straight that was out of sight. An attempt to control the course in 2014 gave rise to the Pwll Du Challenge but this still proved to be a tough challenge due to having to circumnavigate the Cherry Stones beyond the light house. Keeping with the spirit of things, the decision has been made to make the 2015 Pwll Du Challenge a half marathon course, hopefully with celebratory party afterwards to aid recovery. Events page highlights plans for 2015 half marathon. Our very own Nat.H has started up an events page on the old FB. to start the ball rolling on the planning preparation and design of this years Mumbles race, which of course this year is to become a half marathon. Picture Gallery from 2014 event.